Now Archived! PolarConnect event with Steve Kirsche and researchers Ian Baker and Eric Wagner from Summit Station in Greenland on Tuesday, 20 June 2017. You can access this and other events on the PolarConnect Archives site. 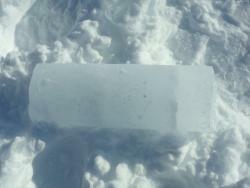 An ice core from a coring machine in Greenland. Photo by Jim Pottinger. There is broad interest in understanding firn compaction for a number of reasons, most importantly for better interpretation of paleoclimate from air that becomes trapped within the firn (granular snow, especially on the upper part of a glacier, where it has not yet been compressed into ice). Firn densification involves a number of different mechanisms which leads to vapor movement. We will determine the mechanisms of firn densification and microstructural evolution as a function of depth using dynamic observations of the evolution of the firn using X-ray computed microtomography (µCT). We will drill an 80-meter firn core at Summit, Greenland and transport it to Dartmouth University. After the field expedition, Steve will work with the team at the university, where we will perform experiments to observe changes based on temperature and stress (due to depth and load). In addition to observing the microstructure as a whole, we can follow the evolution of ice crystals to observe bond formation and bond-breaking under load in detail, as undertaken in some prior studies on snow. Our project will aid in the understanding of firn and ice microstructure evolution in polar ice sheets. This will aid in understanding ice flow and interpreting paleoclimate reconstruction from ice cores. A view of Summit, Greenland. Photo by Craig Beals. The team will travel to Summit Station, located at the peak of the Greenland ice cap atop 3200 meters of ice. 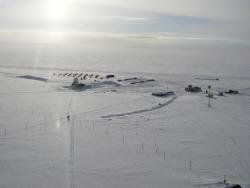 Summit is a scientific research station sponsored by the National Science Foundation that supports a diversity of scientific research, including year-round measurements of air-snow interactions that provide crucial knowledge for interpreting data from deep ice cores drilled both at Summit and elsewhere. Learn more about Summit at the Summit Station website. This article from a Jacksonville periodical, Jax4Kids, discusses a presentation made at the Florida Association of Science Teacher's statewide convention which was made by PolarTREC teachers Steve Kirsche and Adeena Teres. Local News interviews PolarTREC teacher Steve Kirsche to discuss his expedition to Summit Station, Greenland. PolarTREC teacher Steve Kirsche, researcher Ian Baker and graduate student Eric Wagner discuss the research and life in the field as part of the PolarTREC expedition “Dynamic Observations of the Microstructural Evolution of Firn” based out of Summit Station, Greenland. Local newspaper, Saint Johns Sun, reprints an article from the St. Augustine Record about PolarTREC teacher Steve Kirsche's upcoming trip. The Dartmouth Engineer Magazine profile Eric Wagner, the PhD candidate who is a member of the team going to Greenland. PolarTREC teacher Steve Kirsche is also mentioned in the article. Local news reporter from St. Augustine Record visits PolarTREC teacher Steve Kirsche and discusses his upcoming trip to Summit Station, Greenland. Steve graduated from Rensselaer Polytechnic Institute with a degree in electrical engineering. He then served as a Surface Warfare Officer in the US Navy before becoming a stay at home dad while his wife completed her service in the Navy. After her retirement, he was excited to become a science teacher so he could pass on his love of science to his students. Steve teaches comprehensive and physical science to 7th and 8th grade students at Liberty Pines Academy in St. Johns, Florida where he has taught for five and a half years. He has taken part in programs with several organizations and corporations over the past three years to try to offer more robust STEM opportunities to his students. When not in the classroom, he coaches his school's cross country and robotics teams and enjoys running, spending time with his family, and geocaching. Ian has been on the Faculty at the Thayer School of Engineering, Dartmouth College for 34 years. He has been working on the structure, chemistry, and properties of snow, firn, and ice cores for the last 30 years. This work has ranged from fundamental studies of defect behavior in ice, studied using synchrotron X-ray topography, to studies of impurity locations in firn and ice cores and the metamorphism of snow. Eric Wagner is currently an Engineering PhD student at Dartmouth College in Hanover, NH. His research focuses on the microstructure of firn and the mechanics of firn evolution. This is of interest in determining how firn evolution contributes to ice sheet fabric development and interpretation of paleoclimate data where coarse-grained and fine-grained firn exhibit different pore close-off depths. When not in the lab, he enjoys hiking, biking and skiing. Thank you, Cailey. I felt very lucky to get to do this expedition. I hope you're having a great summer and I'll see you back in school in a few weeks. Congratulations on this adventure Mr. Kirshe! Katie is right, you so deserve this, it looks amazing. I can`t wait to see you next year, I hope I have you for science. Go cross country and StuCo. It's only about 90 degrees and humid here in Florida - quite a change from a few days ago for me!! Thanks, Katie! That is so nice of you to say.